Luchi! Not just a type of flatbread but…. Luchi is emotion or emotion is Luchi! The Bengali middle-aged woman torturing the poor husband by rationing the number of Luchi on a Sunday morning by reminding him of the blood pressure! The Bengali middle-class husband feeding the wife a puffed luchi while she is busy making the same for the entire family. After all, “Hatgorom” luchi is bliss. 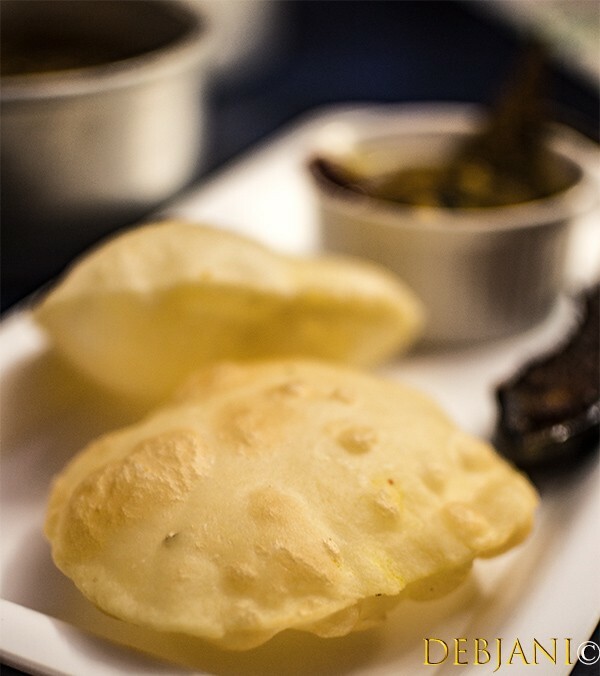 Love and affection can be shown with a luchi if you wish to! The newly wed’s failed attempt of making round and puffed luchi or Making it together! You call it cooking, I call it building the base of the relationship! The girl/ boy’s first job outside the city followed by making loochi for the first time after calling and asking mother! The self-pity phase! 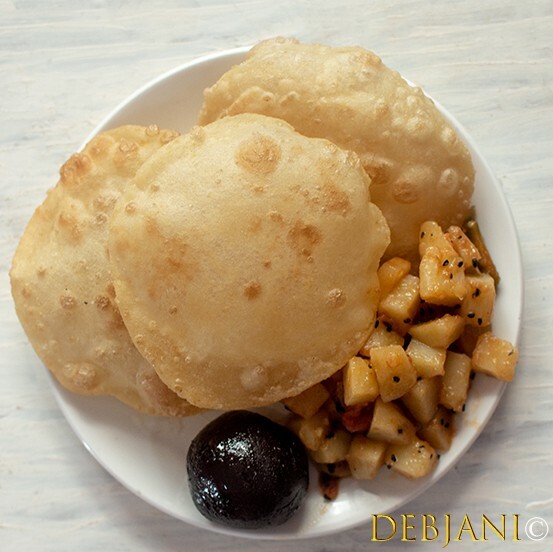 The Biyebari feast starting with Luchi Bonde Jolkhabar in the morning! Last but not the least, having Basi Luchee (leftover) with Payesh! The list is actually endless 🙂 . What else can be the title of this particular post! Loochi and that says it all. I, though, initially was thinking to use “how to make proper luchi” but then I thought just the word is enough to elaborate the emotion. The signature Bengali good old puffed, deep-fried flatbread; Loochi is not Poori. Okay, let me not confuse you or how about me confusing you with a few loochi, the epitome of Bengali main course. Is there a single Bengali household that does not make it once in a while for Jolkhabar, or Dinner or at times for lunch. Here I must tell you, Bengali Jolkhabar is beyond the rich of sophisticated Breakfast. 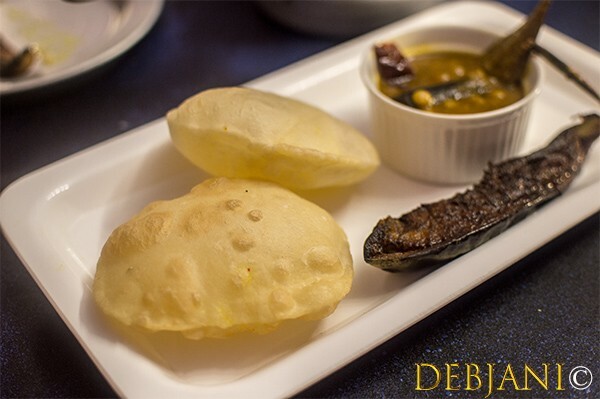 The Famous Bengali style deep-fried flour-based flatbread is Luchi. In fact, equally famous in Orisha, Maithil and Assam and goes by the same name. The signature whitish color comes from Maida aka all-purpose flour. needless to say, it is a deep-fried flatbread. I remember asking Mammam (My Aunt) about the process of making proper Luchi. Growing up in a North Calcutta household, being there at my Didar Bari and her ancestral home in Birbhum and finally married to a Bengali Muslim, I have eaten and seen various kind of Luchi. It was always Moidar Sada Luchi (prepared with all-purpose flour) at my place, loochi prepared with a mixture of Ata and Moida (Whole wheat flour and all-purpose flour) at my Dida’s birthplace, Moidar Loochi fried in Ghee (aka Ghee-er Luchee) at Dida’s place and last but not the least atar Loochi (prepared with only Whole wheat flour) at my in-laws. Surprisingly, all different but all good. While the Maidar Luchi is the most common form, the ata-moidar loochi is equally good and the Atar Luchi is the earthiest one and finally, the Ghee-er Luchi is the richest form. Here I must mention, another very important form of luchi, dida used to make, was Taka Luchi. Here, however, I will be sharing the process of making Moidar Luchi in the post. 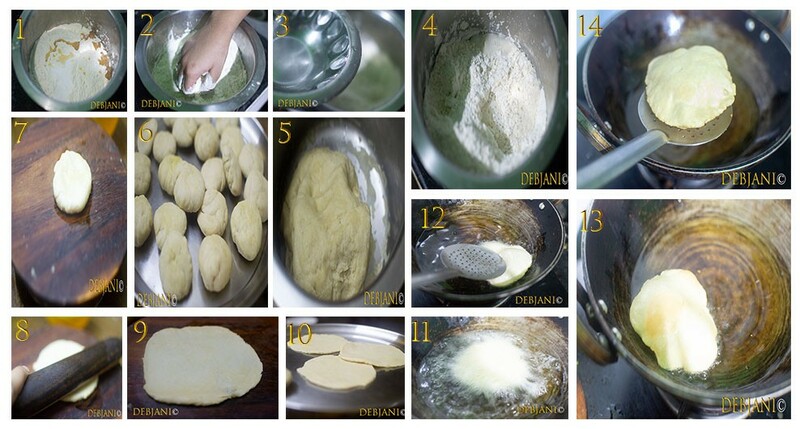 I must mention, the trick I learn from Mammam which I still follow while making this particular type of flatbread. Mammam used to say “the trick of getting the perfectly puffed loochi is in the process of shaping the dough! It should be completed in 2.5 strokes! One, two and a half!” Am I confusing you? I suppose I am. Well, let me elaborate. 2.5 Strokes to get it done! Luchi is nothing but deep-fried puffed bread and is considered prepared properly when it is not flat or not puffed properly. To achieve that, the dough must be prepared properly. The process I will be elaborating below. But, what makes it not only soft but puffed is how you are rolling it. There comes the rule of 2.5. Strokes one, stroke two and stroke 1/2 and you are done! Traditionally Loochi was fried in Ghee. However, these days calorie conscious us prefer to fry it in vegetable oil. Though a touch of Ghee makes it tastier. I add little ghee while making the dough and a little ghee in the oil so that my Loochi absorbs the flavor. 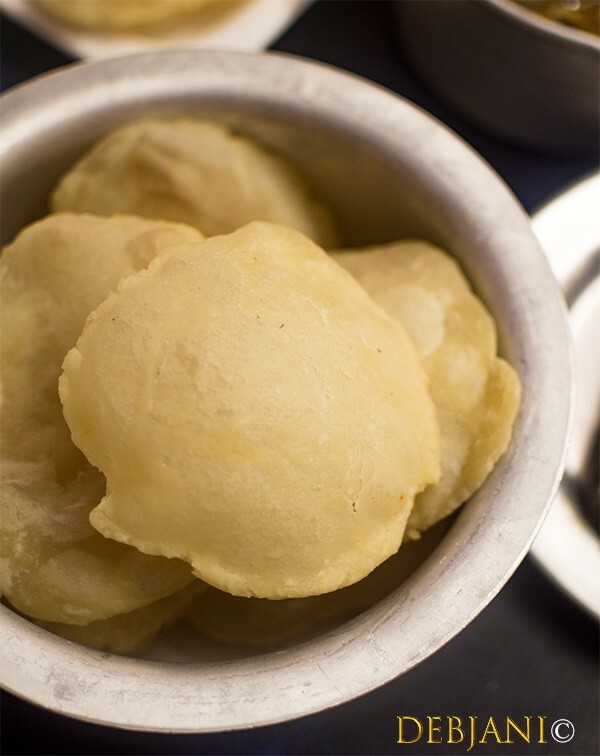 Luchi is a famous Bengali flour-based deep-fried bread. Take Maida along with salt in a deep bowl and mix. Now add Ghee and mix using the finger. The End product should be a crumbly mixture. Be available with 1 Cup warm water. Now add water little by little and knead the flour to form the dough. The dough must not be soft but not stiff as well. You may refer to the picture. Cover the dough with a wet cloth and leave for 15 minutes to give it rest. Now take the dough and make small 2" size balls out of it. Take 1 Tbsp. oil in a bowl and keep it behind the rolling plate. Take one ball and apply little oil to it and flatten the ball on the rolling plate. Now using the Rolling pin roll the ball into a small disk. Here, you must not roll vigorously and try to keep the rolling to 2.5 strokes. In the meantime, heat the oil in a deep pan along with the Ghee. Now Put one flatten flour disk in the mid of the pan. Using a spatula press it a bit. It will help it to puff. Turn it and fry the other side as well. The color should be near creme' but not brown which means no over-frying at all. Strain it from the oil and fry rest of the Luchi in the same manner. Ghee is totally optional, however, gives amazing flavor. In fact, you can use Ghee instead of Oil if you are not that calorie conscious. Now comes the serving part. Whenever it is there for breakfast we prefer ours with Aloo Chorchori or Begun Bhaja or both. 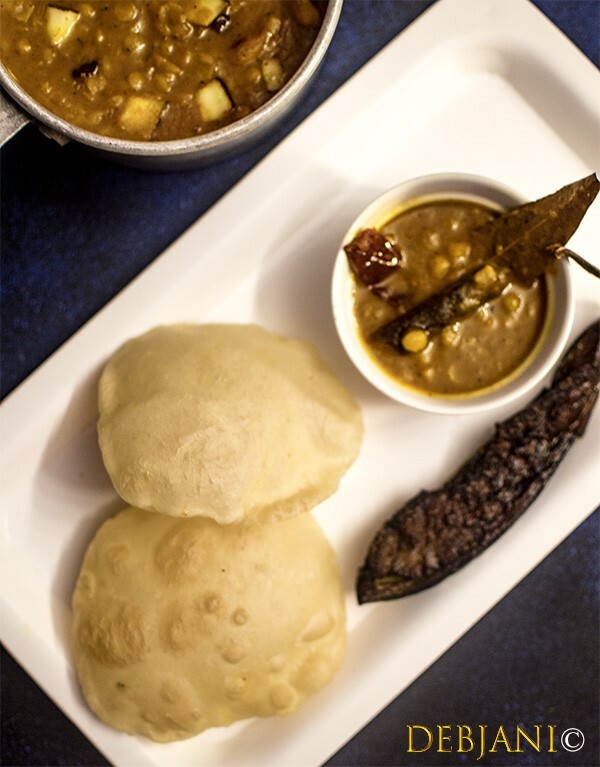 If it is part of the lunch or dinner then We prefer it with Cholar Dal or Aloor Dum and a side of Bhaja. You can serve it with non-vegetarian delicacies such as Kosha Magsho or Mangshor Jhol or Doi Murgi or a simple Egg Curry. 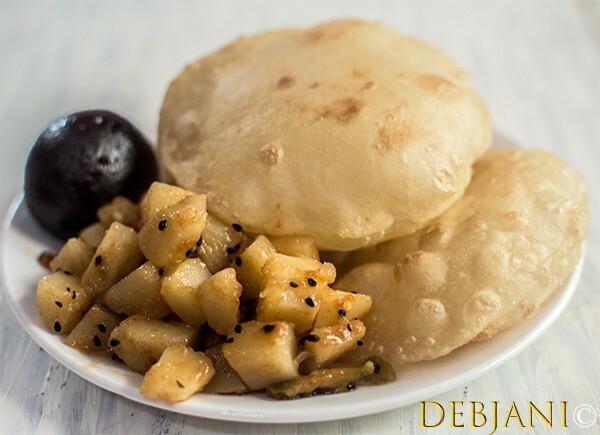 Have you tried the Luchi Recipe from Debjanir Rannaghar! « Gujiya, the Bengali sweet; Meyebela revisited with the Ring-shaped Sweet!